Lunches built by you the way you like it! We create delicious, fresh to order food, NOT fast food. Please be aware that at times this may take a bit of extra time when we get busy. Fresh large white mushrooms hand battered in our house seasoned batter, made fresh per order. Large mushrooms stuffed with our fresh made house sauce and imitation crab or jalepeno, battered in our house seasoned batter, made fresh per order. Large fresh onion rings hand battered in our house seasoned batter, made fresh per order. Golden fried french fries topped with our homemade chili verde, onion, peppers, cheddar and diced tomato. Served with sour cream. Hand cut breast portions coated in our house seasoned flour, fried and coated with our homemade zesty bbq sauce. Iceberg lettuce, onion, peppers, and tomato. Iceberg lettuce, onion, red & green peppers, and tomato. A bowl of homemade soup. Fried tortilla, with lettuce, black beans, onion, peppers, tomato, olives, avocado and cheddar. Served with homemade salsa & sour cream or dressings. Fresh greens, onion, peppers, chicken, bacon, avocado and cheddar. Iceberg lettuce, onion, peppers, mushrooms & grilled sirloin strips. Made from fresh ingredients from our kitchen. Loaded with greens, onions, peppers, tomatoes, olives, chili verde and shredded cheddar in a fried flour tortilla. Fried corn tortillas with beef, chicken or chili verde, lettuce, onions, peppers, tomato & cheddar. Served with 2 side choices of tots, fries, mash, onion rings, soup, salad, cottage cheese or fruit. Burger patty a top texas toast, with fries or mash with brown gravy. 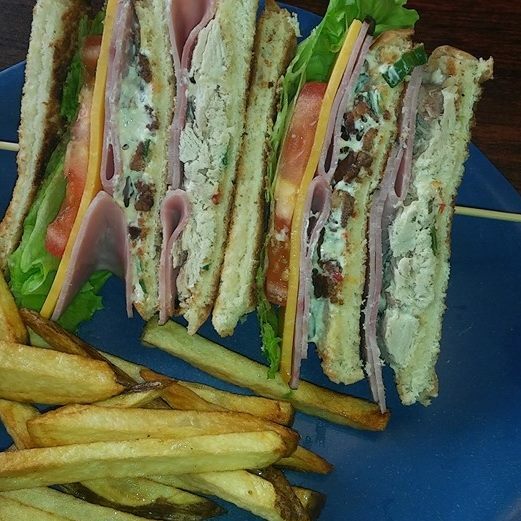 Slow roasted turkey a top texas toast, served with fries or mash with poultry gravy. Slow roasted shredded beef a top texas toast, served with fries or mash and brown gravy. Fresh burger patties made to order. 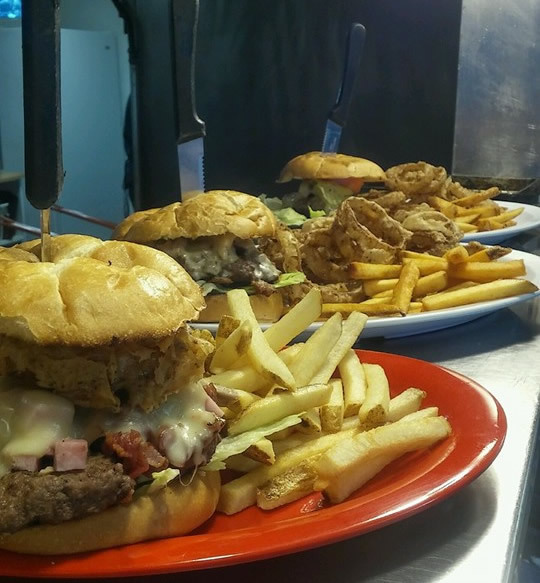 Served with one choice of tots, fries, onion rings, soup, salad, fruit or cottage cheese. Add cheese for .50 or make it a double for additional 1.99. Diced ham, diced bacon, pulled pork topped with an onion ring. Diced ham, diced bacon, jalapeno, pulled pork topped with an onion ring. 2 large tocados filled with chili verde and house sauce. Served with a cup of homemade soup. Turkey, stuffing, mash, corn, cheddar and turkey gravy all stacked on texas toast. Country fried steak, mash, corn, country gravy & cheddar stacked on texas toast. Hand breaded chicken breast, mash, corn, country gravy & cheddar stacked on texas toast. Corned beef, sauteed cabbage, onion and peppers. Served with a biscuit. Seasoned with a delicate blend of spices. Great for breading or battering. Our delicious blend of seasonings, sauces and vegetables. Slow roasted with fresh ingredients. Blend of flours and seasonings. Blend of spices veggies and sauces. Seasoned tomato, onions, burger and beans. Chunky blue cheese - Tangy 1000 Island - Creamy ranch - Cucumber vinaigrette.